Find a luxury hotel in Bali from the Hotique Hip Hotels Guide. Hotique is an independent guide, featuring luxury 5 star design hotels, hip hotels and unique boutique hotels including hip hotels in Bali. 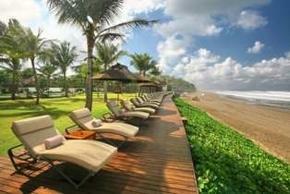 View our featured hotels in Bali below or search for a boutique hotel in Bali. Welcome to Hotique's selection of Boutique Hotels in Bali - including hotels in Jimraran Bay, Ubud, Nusa Dua and cliff top private villas in the south of Bali. Bali is a favourite destination for a honeymoon, relaxing treat or a romantic break with long sandy beaches, local culture and stunning scenery. From small luxury hotels to hotel resorts, pick your perfect hotel from our hand-picked selection of the best luxury hotels in Bali. Don’t forget to experience the delightful Balinese Spa’s. 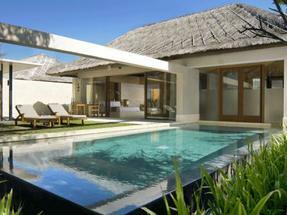 The Bale- 29 Contemporary Villas, all with private swimming pool, shaded day bed (Bale) and secluded garden. A beautiful Balinese boutique hotel – highly recommended. The Viceroy Bali - Just 11 private villas in lush tropical surroundings close to the rice fields and cultural attractions of Ubud. A favourite honeymoon hotel. Karma Jimbaran - Private and spacious one two, three and four bedroom villas in lush tropical surroundings just above Jimbaran Bay. Karma Kandara - Cliff top location, private beach access and spacious one two, three and four bedroom villas in the South of Bali, 20 mins from Jimbaran Bay. Ideal for families. Find a stylish boutique hotel in Bali from the Hotique Hip Hotels Guide.